It’s a query which unwraps a whole sackful of humbuggery. It creates a false expectation of hope in the kids, and puts unnecessary pressure on parents and guardians, already struggling to keep up with the flurry of festive-season franchise-reboots bombarding their progeny during every commercial break. These generalities can occasionally result in a few briefly blank faces – particularly in the 6-10 age-range where branding really starts to sink its hooks into their dark recesses of their acquisitive little souls – but it generally yields a more engaged response from the individual child. What do they like? Girls like dolls and dressing up. Boys like soldiers and super-heroes. Oh, lots of little girls still favour their babies and their dress-up dollies, but the expectation that they will drool like Pavlov’s puppies as soon as anything pink and spangly is paraded in front of them simply does not apply with the same certainty as it would have a decade past. Case in point: in 2015, seeing the popularity of the fem-centred ‘Hunger Games’ film franchise, manufacturers of the foam-firing Nerf Gun adapted their product – by then a regular on boys’ Santa lists – for a female market. Nerf Rebelle came in glittery pinks and purples – OBVIOUSLY. Girl visitors to this Santa objected, not because of the commercial condescension of the campaign – but because it was more difficult to ambush their friends when carrying a lump of day-glo pink plastic. Girls continued to ask Santa for Nerf, but the Rebellion was quashed. 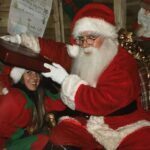 As Santa it was the first instance – within my experience of the grotto – where kids were conspicuous in rejecting a gendered product. Girls wanted Nerf, but didn’t like the blatant ‘girlie’ re-boot. As Santa it was the first instance – within my experience of the grotto – where kids were conspicuous in rejecting a gendered product. Girls wanted Nerf, but didn’t like the blatant ‘girlie’ re-boot. As many little girls as boys in 2015 and 2016 were asking THIS Santa for super-hero toys and costumes – particularly Wonder Woman and Supergirl (spinning-off from their recent on-screen re-imaginings), Batgirl and – surprisingly? 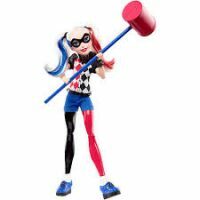 – the villain Harley Quinn. DC produced a ‘Superhero Girls’ doll, book and apparel range, aimed primarily at younger girls, but also, much to their surprise, appealing to many boys (and some big ones – I couldn’t resist the Wonder Woman figure). Interestingly the DC Super Hero Girls promotional website is a pink-free zone! Often children dress up to have their photos taken with Santa, and I’m glad to say that more came to see me, last year, in the garb of Supergirl and Wonder Woman than did as Snow White. For years Pixar’s ‘Cars’, ‘Planes’ and ‘Monsters Inc.’ dominated the Disneyfied wish-lists of little lads, but the universal pre-teen popularity of ‘Frozen’ has tilted that balance. 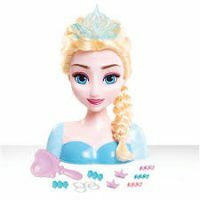 Disney Princesses still prevail upon the wish-lists of many little girls in 2016 – but at least as many boys were asking for Anna and Elsa toys. ‘Toy Story’ remains universal: the most requested characters for BOTH sexes? All-round action-hero Buzz Lightyear action-hero, and Jessie the Cowgirl…ALSO an action-hero. Disney Princesses still prevail upon the wish-lists of many little girls in 2016 – but at least as many boys were asking for Anna and Elsa toys. More boys than girls asked me for kitchens and Hoovers, this year. More girls than boys requested Lego… in ALL its many iterations. In both cases it was a close-run thing. Craft-activity toys, firmly the domain of the girlies for most of the past two decades, are now equally popular. begin? It’s all a matter of perspective. Toys are toys. Kids are kids. Fun is fun. That’s all that matters. End of. Damn right, kiddo. You tell him! This is a really interesting perspective, I really hope toy manufacturers and retailers take note! I love the anecdote at the end about the little boy, he sounds awesome!